view another article... This foot condition is the new back pain — it’s everywhereCarestream, CurveBeam to spread word about weight-bearing CTNew Cartiva ImplantPain Free Plantar FasciitisUFAI featured on ABC NewsCarolina Panthers Star Lotulelei's Foot InjuryFoot Surgery InnovationsBiggest Opportunities for Foot SurgeonsDoctors TV Show - Foot Surgery while Pregnant10 Diseases Your Feet Can Reveal, Readers DigestPlantar Fasciitis TreatmentsThe Doctors TV, Living with Plantar FaciatiisHow to Stop Foot Pain for Good44 Ways to Correct Hallux ValgusDo fat-soled running shoes protect aging joints?Ankle replacement can restore mobilityCam Newton's Ankle InjuryMinimally invasive Foot & Ankle Surgery49ers' Crabtree 'amazing' Achilles recoveryAbout Kobe Bryant's Knee Injury3-D Scan Reveals Foot Damage by High HeelsAlbert Pujols' Foot InjuryWill Kobe Return? Doctors Raise Questions About Laker Star's Future In The NBAWhat Kobe must do to prove 'doubters' wrongKobe Bryant's difficult task ahead after injuryPau Gasol's return from foot injuryIs barefoot running a bad fad, or better choice?Born to Run Barefoot?Born to run barefoot? Some end up getting injuredCan a $15 basketball shoe have game? "If he was a normal athlete at seven months, he'd be back to doing normal athletics, the problem is, he's an elite athlete. That's what is amazing about it." The ESPN trucks are already at the Staples Center. The plan for Friday is predictably to train the cameras on the stars as often as possible, but the lead players from the Warriors and Lakers appear to be headed on diverging paths. While Warriors point guard Stephen Curry (concussion) was cleared for noncontact drills Thursday, Lakers shooting guard Kobe Bryant (Achilles tendon) skipped Thursday's practice because of soreness in his left foot. Curry endured what the Warriors called a mild concussion a day after the left side of his face was slammed and then ground into the hardwood floor during a loose-ball chase Monday in Utah. He sat out Wednesday's loss, but he flew with the team to Los Angeles late that night and was able to take shots during a light practice Thursday. The point guard is listed as day to day. "Looking at him, talking to him, he's as crazy as normal." The NBA has increased its concussion protocol since 2011-12, mandating an independent third party to clear a player before his return. The process actually starts during the preseason when a player's cranial nerves, balance, eye movements, reaction times and memory are tested, and those become baselines to be compared when trying to return from a concussion. Dr. Vernon Williams said the league has made great strides, understanding that a loss of consciousness isn't necessary to diagnose a concussion and that the injury comes with long-term risks. The medical director of the Kerlan-Jobe Center for Sports Neurology in Los Angeles wants all pro sports to do more. "I think we're still dealing with athletes, who, by nature, are competitive and have grown up and developed in a kind of gladiator mentality," Williams said. "They're supposed to be there for their team, play through it, stand up and be tough. All of those are great characteristics, but not when you're dealing with concussions." Curry's lone symptom has been a headache that dissipated, so the Warriors deemed it a mild concussion. Williams said that doesn't mean the Warriors' point guard is in the clear. Simply because Curry hasn't reported nausea, dizziness, memory loss or a loss of consciousness doesn't mean anything - yet. According to Williams, the medical world used to grade concussions 1-3 and now is trending toward mild, moderate and severe as replacements, but none of those assessments come before the episode is complete. "We've learned that we don't grade concussions early, because all concussions are an injury to the brain," he said. "There is a tremendous variability from individual to individual with respect to the duration of the symptoms. It has nothing to do with how tough they are, their commitment or their dedication. There is significant internal variability from person to person." Bryant is one of those players who will prove his toughness every time he gets a chance, and his dedication and commitment are rarely questioned.. At 35 years old, he was back on the practice floor seven months after completely tearing his left Achilles tendon. "If he was a normal athlete at seven months, he'd be back to doing normal athletics," said Dr. Bob Baravarian, a foot and ankle surgeon at Saint John's Health Center in Santa Monica. "The problem is, he's an elite athlete. That's what is amazing about it." Baravarian said Bryant's aggressive return to the court is OK, but he wonders if the tendon is strong enough to handle his explosive first step on drives to the basket and the jarring push-off needed to get separation for his fadeaway jumper. Lakers power forward Jordan Hill told reporters it was nice to have the "soul of the team back," and the man who is about to lose his job to Bryant, Jodie Meeks, said, "He's so intelligent that he helps guys get in the right spots and makes the game a lot easier. ... He's the alpha dog." 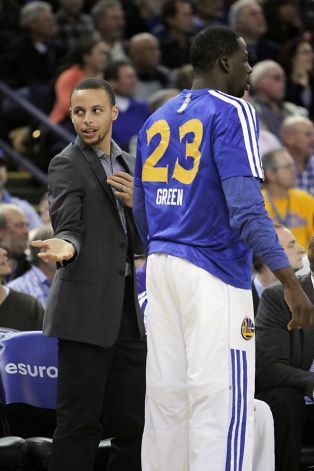 The cameras might be left capturing one alpha dog (Bryant) coaching and the other (Curry) playing Friday. Of note: The Warriors have lost 10 straight road games to the Lakers, dating to March 23, 2008. ... The Warriors' 125-94 victory over the Lakers on Oct. 30 was their largest opening-night win in franchise history. ... Lakers point guard Steve Nash is out with nerve-root irritation in his back. ... Lakers center Pau Gasol is donating $1,000 for every point he scores Friday to support the Philippine typhoon-relief effort.